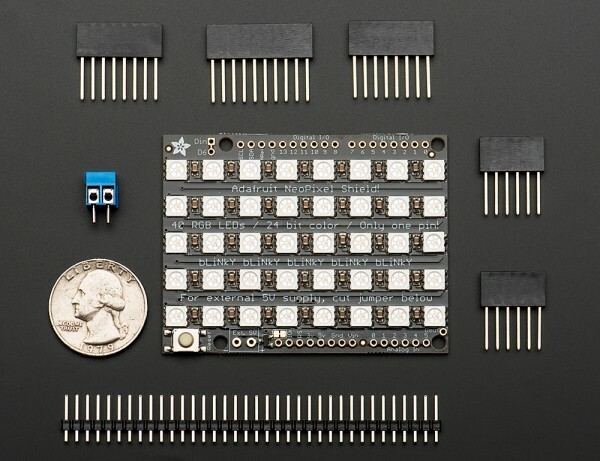 NEW PRODUCT – NeoPixel Shield for Arduino – 40 RGB LED Pixel Matrix « Adafruit Industries – Makers, hackers, artists, designers and engineers! 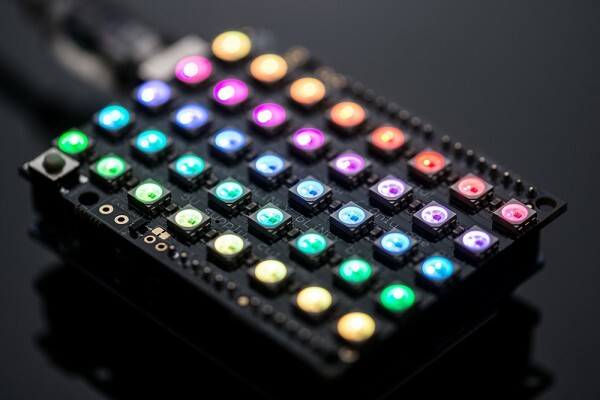 NEW PRODUCT – NeoPixel Shield for Arduino – 40 RGB LED Pixel Matrix – Put on your sunglasses before putting this shield onto your ‘duino – 40 eye-blistering RGB LEDs adorn the NeoPixel shield for a blast of configurable color. Arranged in a 5×8 matrix, each pixel is individually addressable. Only one pin (Digital #6) is required to control all the LEDs. You can cut a trace and use nearly any other pin if you need some customization. If, say, you need MORE blinky, you can chain these together. For the second shield, connect the DIN connection to the first shield’s DOUT. Also connect a ground pin together and power with 5V. There you go! You can chain as many as you’d like although after 5 or more shields you may run low on RAM if you’re using an UNO. We include both stacking headers and plain headers. Use whichever you prefer – there isn’t a lot of space left over for the ‘duino pin breakouts so if you want to wire up some other outputs or sensors the stacking headers are good. For a slim sturdy look, solder on the plain headers. 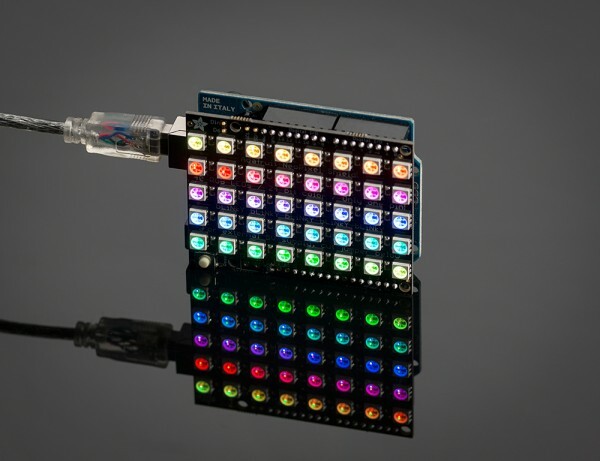 Once thats done, check out our Neopixel library on github and our installation tutorial here.